Abstract : Generating plausible deformations of a character skin within the standard production pipeline is a challenge. This paper presents a volume preservation method dedicated to skinned characters. As usual, the character is defined by a skin mesh at some rest pose and an animation skeleton. 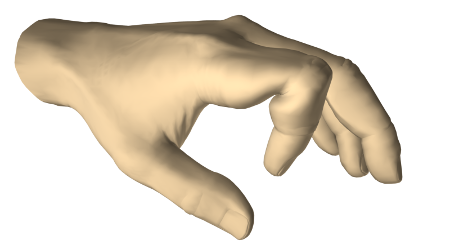 At each animation step, skin deformations are first computed using standard SSD. Our method then corrects the result using a set of local deformations which model the fold-over-free, constant volume behavior of soft tissues. This is done geometrically, without the need of any physically-based simulation. To make the method easily applicable, we also provide automatic ways to extract the local regions where volume is to be preserved and to compute adequate skinning weights, both based on the character's morphology.